Some small details just didn’t fit into any of my previous columns from the Middle East. For instance, did I mention Osama is dead? 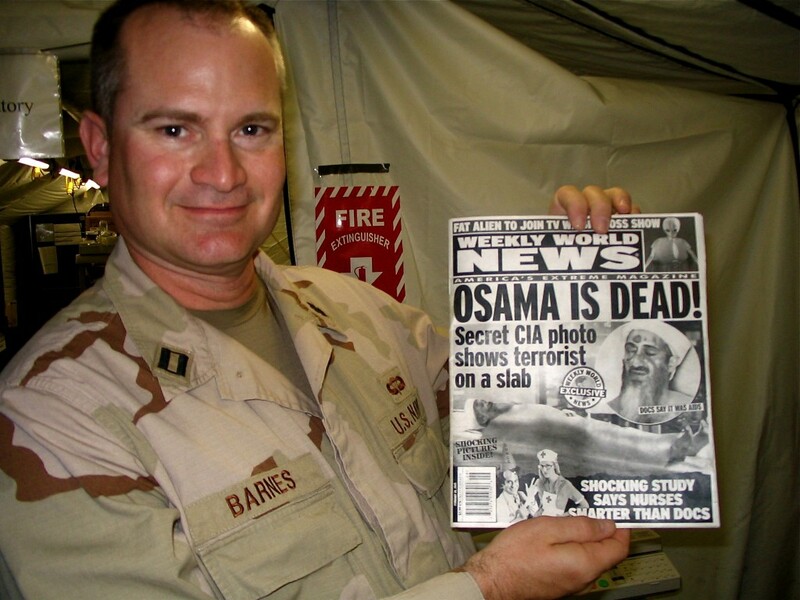 Or at least that was the headline in a copy of tabloid magazine Weekly World News being read by some nurses at U.S. Military Hospital Kuwait on Camp Arifjan. They made sure I didn’t miss another story in the magazine, one they said only confirmed something they have known for years. I never did see Osama bin Laden, dead or alive. For that matter, I never saw a lot of things that make the big news, the roadside bombings and political battles. I saw lots of little things. And since returning, I’ve been trying to sort through not only my notes, but my thoughts, and make sense of them for a wrap-up column from the trip. People keep asking a couple of questions: What were the highlights of the trip? And did it change the way you look at things? The first question is easy. 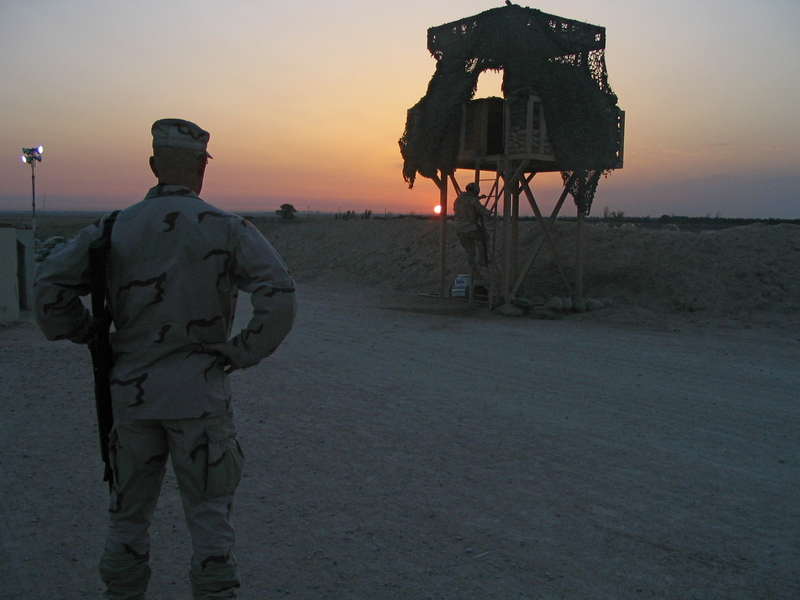 The highlights were being strapped into a jet, in a seat facing backwards, and getting catapulted off of an aircraft carrier; standing in the guard tower at the Iraq-Kuwait border; and, most of all, meeting the troops and being overwhelmed and awed by the enormous logistical challenge of their day — each and every day. But how did the trip affect me? That’s hard to say. To start with, it made me feel guilty. No, wait. Before the guilt, there was nervousness. In a way, it seems silly. Even before I left home, I knew I wasn’t going anywhere near the most dangerous spots, that I would barely even set foot in Iraq. I knew the last thing the Navy wanted to do was take seven journalists on a PR tour and have someone get hurt. Still, yes, I was nervous. Were the roads in Kuwait safe? What about the hotel that, although seemingly very nice, wasn’t in the cozy confines of a heavily guarded base? Should I relax after hearing that lots of American civilians stay there? Or get more nervous, because that would seem to make it a target? In hindsight, the trip was relatively safe. But on the way over there, as all these thoughts ran through my head, I wondered what it must be like for the troops who are really heading into the unknown. How do they feel? Tyner, a 30-year-old from Pittsburgh, is a Construction Electrician 3rd Class of the Navy Reserve Seabees assigned to the Tactical Movement Team of Naval Mobile Construction Battalion Two Three. He said when he went to work, securing and rebuilding the city, just seeing the children’s smiles made it worthwhile. But he also said there was a nearly constant sense that, at any moment, something could happen. After talking to Tyner and other Seabees who had just returned from Fallujah, I met three sailors who were about to head north into the city. These were big, tough-looking guys. You could almost picture them in a gym back home, bench pressing piles of weights. And while it’s tempting to describe them as brave and fearless, by looking at the tension in their jaws and hearing their voices, that wouldn’t be accurate. Brave, yes. But fearless? Not if you’re human. And if the trip did one thing for me, it took the numbers of the war — the 150,000 U.S. troops, the 1,545 dead , the billions of dollars — and replaced them with human faces, human stories, human hopes and human fears. A lot of things surprised me. I was surprised to learn Kuwait has a population of 2.42 million, and fewer than a million are Kuwaiti citizens. Oil, we were told, has made the Kuwaiti citizens wealthy enough that they have turned to other countries for much of their labor. Speaking of oil, I was surprised, although I probably shouldn’t have been, at how its presence is everywhere. Oil fields. Oil trucks. Oil tankers. I was surprised that the food, especially at the Army bases, was better than I expected. I actually gained weight. 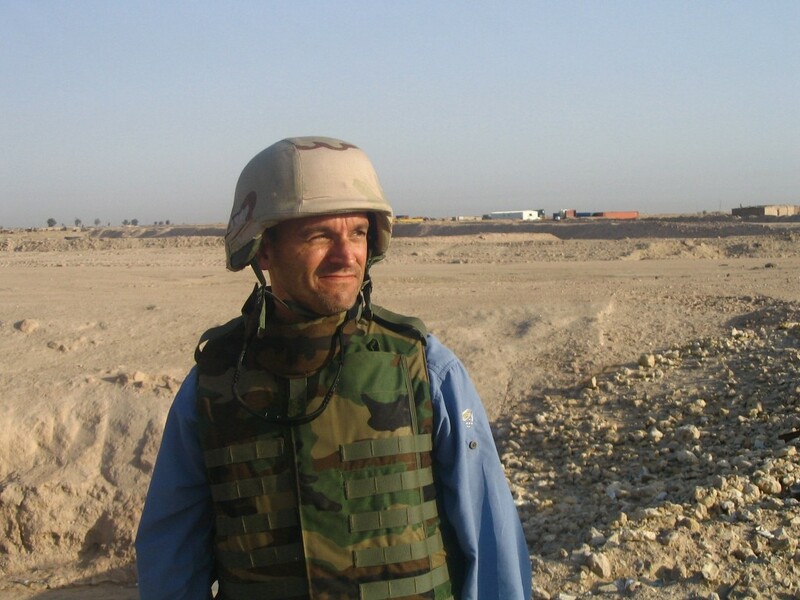 I was surprised to walk through the bases and ships and see a lot of gray hair and wrinkles. I had this image of baby-faced kids fighting a war. And there certainly are plenty of young troops. But many were reservists close to my age, 43, or older. Cmdr. Roxanne Tweedy, a nurse at the Arifjan hospital, was born in St. Luke’s Hospital in Jacksonville, graduated from Lee High School and now lives in Kensington, Md. She’ll turn 61 in June. And she has asked to have her stay in Kuwait extended. “I feel good, and I’m enjoying it,” she said. The hospital tents and the banter within them reminded me of M*A*S*H, only with state-of-the-art 2005 equipment. And it tells you something about the age of our troops that several of the sailors I met, without prompting, made reference to the 1970s TV show. One final surprise. As I watched the troops, I felt an emotion I didn’t expect. Envy. Not that I’m about to ask to trade places with any of them. I’m happy to be back home, sleeping in my own bed, seeing trees and grass, not having a “shooter” sitting in the passenger seat of my car. But being in that atmosphere gave me an appreciation for the camaraderie. That’s not to say everyone there is happy. Or they aren’t counting the days until they come home. Which leads me to guilt. First of all, I felt guilty when we got to Arifjan — a dry base in a dry country — and mentioned that we had spent the previous night in Italy, on a base where you can drink beer. I know people who have been in the Navy for years who have never been on an aircraft carrier, let alone fly off the deck. In the end, though, the thing I felt most guilty about was this: I was going home. It’s easy to make it through a few days somewhere when you know that’s it. A few days. Not six months. Not a year. Not who-knows-when. Our trip had some glitches that nearly extended it. But only by days, not weeks or months. So after talking to two Jacksonville sailors on the aircraft carrier — and hearing Danielle Laymon was about to miss her daughter’s first birthday and Owen Butters has missed all four of his daughter’s birthdays — I felt guilty that I was going home to watch my 3-year-old growing up, bristling when I call her my “little” girl or even say she is “a little confused” about something. I left home expecting an epiphany. I came back with all kinds of emotions, mixed and swirled and tossed and turned. Unless the Weekly World News is onto something, Osama isn’t dead. We’ve spent hundreds of billions of dollars in a country that wasn’t nearly the threat we thought. We’re banking on democracy in Iraq to be lasting, life-changing and peace-producing — not just for the Iraqis, but for the Middle East and for us. I want to believe. For their sake and our sake — and especially for the sake of the troops who are still there — I really want to believe.